Diversity is an incredible resource that is likely going untapped in your organization...Here is your chance to change that. Look around this country. Diversity & Inclusion professionals, as well as countless committed leaders and employees have been working hard for decades to create organizations that are more diverse and inclusive. They are working hard to make Diversity & Inclusion (or D&I) a part of the DNA of their organizations and communities. Yet for every two steps forward, we still take one step back. Or two. Or three. It's time for our approach to make sure that two steps forward remains just that: two steps forward. It's time for Diversity 3.0: Transformational Diversity. Transformational Diversity requires us to build new skillsets to go along with new mindsets. It requires us to respond to ever greater levels of complexity. When we operate at this level we ensure that the fact of Diversity, the fact that we are all different to one degree or another, actually transforms individuals with ideas and experiences from ineffective siloed belief-bunkers into truly inclusive environments where everyone interacts at the peak of professional effectiveness. 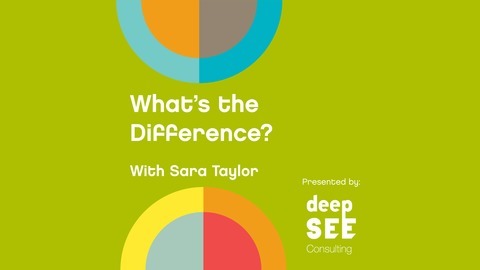 Sara Taylor is author of the best-selling book Filter Shift, and founder of deepSEE Consulting. 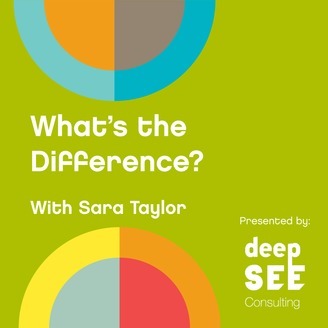 Each podcast episode of What's The Difference? provides the tools, resources, and insights you need to begin to transform your organization or the organizations with whom you work into the inclusive, effective powerhouses of the 21st century.